Take a good handful of Sorrel, beat it in a Mortar with Pippins pared, and quar|tered, with a little Vinegar and Sugar; put it into Saucers. 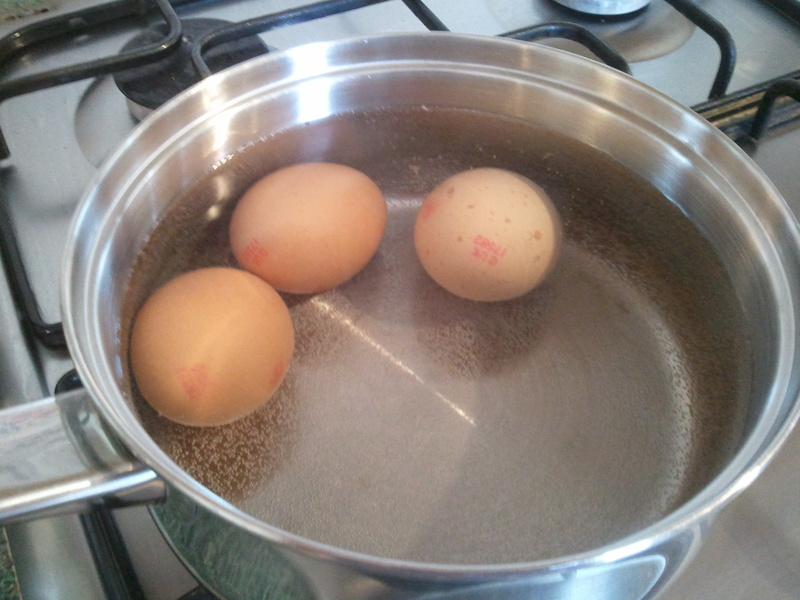 First, I hard-boiled the eggs. 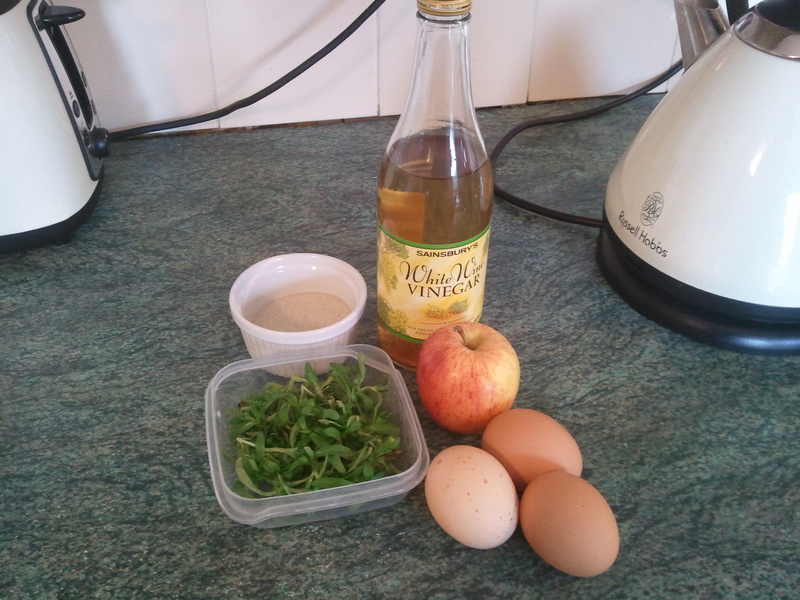 Then I washed the sorrel, and put it with a pealed and quartered apple with 1 teaspoon each sugar and vinegar. 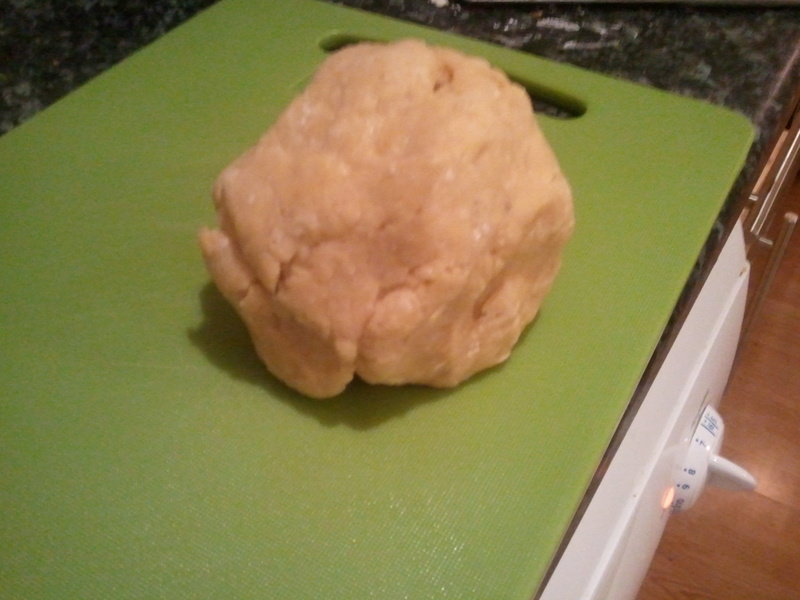 I then began to squash and pound it in a pestle and mortar. I pounded it for about 10 minutes, until it began to turn into a green pulp. I hard boiled the eggs, then pealed and sliced them and put the green sauce on top. I quite enjoyed this dish, the green sauce is sharp and sweet and quite tasty. 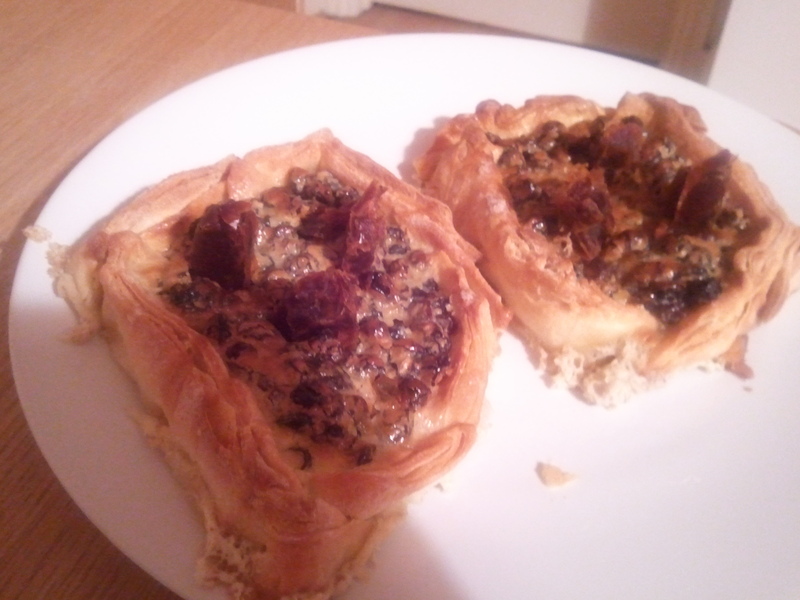 My mum tried them too and said they were rather nice. It would make a nice addition to an Easter buffet. 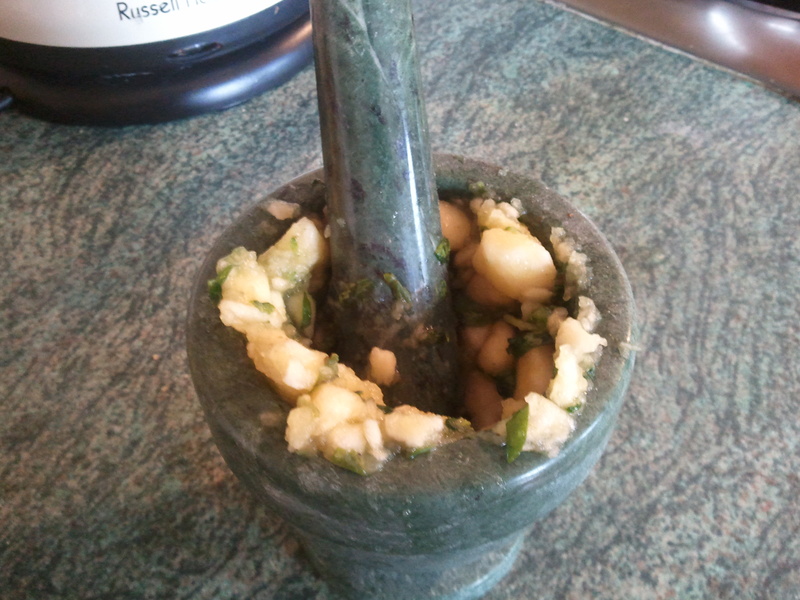 It’s also very easy to make if you don’t mind a bit of work with the pestle and mortar. It is worth seeking out sorrel for this – it’s an underrated herb/vegetable in my opinion. 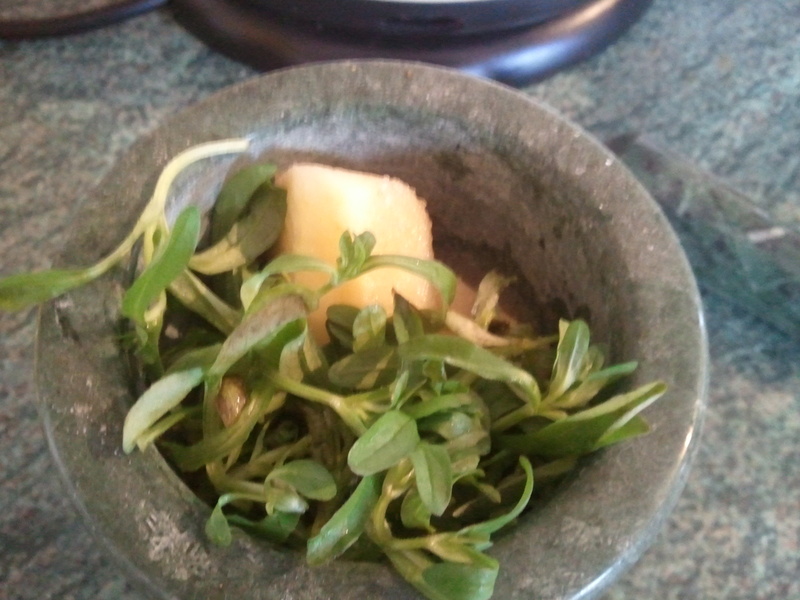 Put the sugar, vinegar, sorrel and apple in a pestle and mortar and pound until the mixture turns into a pulp. Put the eggs on a dish and dollop the sauce on top. So there you have it – festive eggs! Happy Easter everyone! This week I’m looking at eggs, or more specifically, Easter eggs. 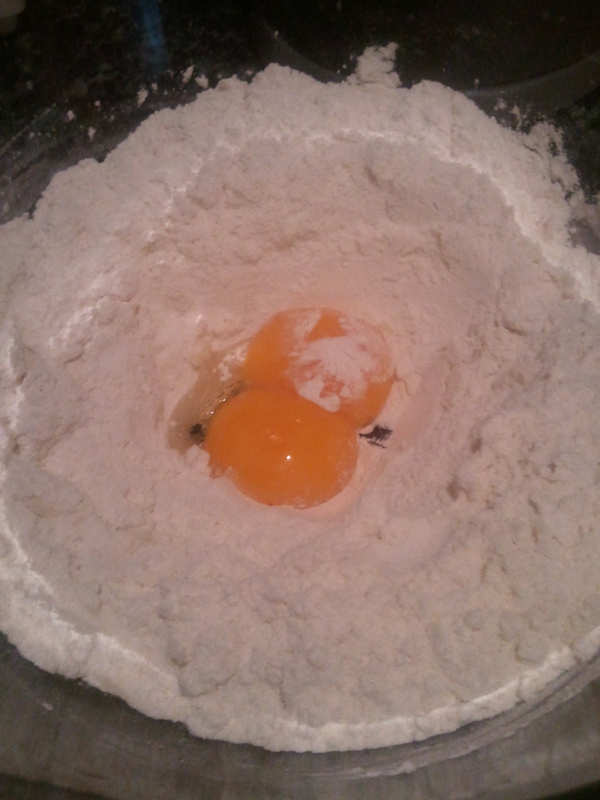 I have previously written a little bit about eggs in general, you can read the post here. Of course, eggs are associated with Easter today, and it seems that they were in the Early Modern period too. Eggs, amongst other things, were forbidden during lent. Once Easter arrived, they were back on the menu. Easter eggs appear in a proverb, recorded by John Ray in A collection of English proverbs (1678), “I’ll warrant you for an Egg at Easter” – the sense of the proverb (as far as I can tell) is something like “as sure as eggs at Easter”. James Shirley appears to have been particularly fond of a related egg-based saying – he uses the phrase “not worth an egg at Easter” in at least two plays, The Example (1637) and Love’s Cruelty (1640). Incidentally, both of those plays, and several others by Shirley, as in the Petworth collection. . One of these will likely be making an appearance soon on my other blog. Clearly, eggs were considered a common food at Easter time. Quite a feast! Sadly I will only be cooking one of these foods this year, however. For my Easter dish I will be cooking “sodden egs with greene sauce”. “Sodden” means boiled, rather than “wet” or “soaking” as it does today. According to the OED it is the strong past participle of “seethe”, suddenly the phrase “seething with anger” makes sense now I know it means “boiling”. This kinde of Sauce, I neuer tasted my selfe: yet am bold to communicate and commend it to my friends, as I find it described by the Italian Freitagio. The Italian (as all the world knowes) is most exquisite in the composition of all sorts of Condiments, they being indeede the better part of his Diet. All kind of Greene-sauce, is questionlesse best in season, while herbs retain their full strength and perfect vigour. 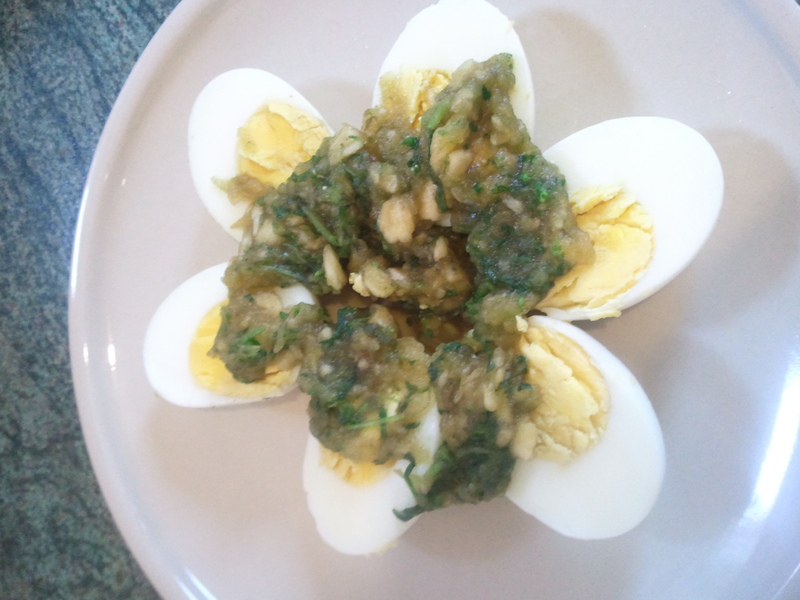 I’ll be cooking the eggs in green sauce later today and will post the recipe shortly after. Take twenty Eggs with half the Whites, and beat them well and mix them with fine flower and beaten Spice, a little Salt, Sack, Ale, and a little Yeast, do not make your Batter too thin, then beat it well, and let it stand a little while to rise, then fry them with sweet lard or with Butter, and serve them in with the Iuice of Orange and Sugar. I didn’t think I’d need 20 eggs worth of pancakes, so I scaled the recipe down to 4 eggs. There were a couple of other pancake related recipes in the book, including one for making “Pancakes so crisp as you may set them upright”, which involves boiling them in lard (deep frying I suppose) until they “look as yellow as gold”. Don’t think I fancy that one myself! 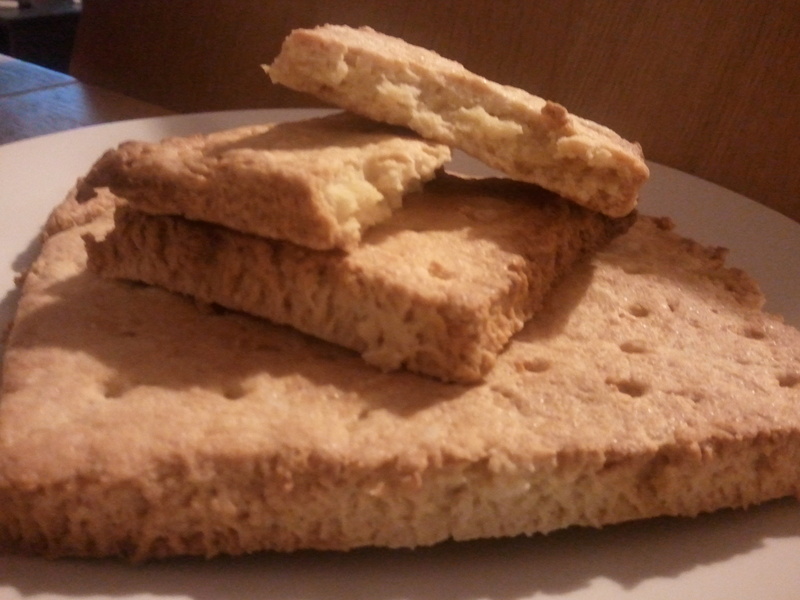 There is also a recipe for a “Sussex pancake” which caught my eye, which is just pastry made with “hot liquor” rolled thin and fried, served with spices and sugar. So, I decided to go with the “good Pancakes”. 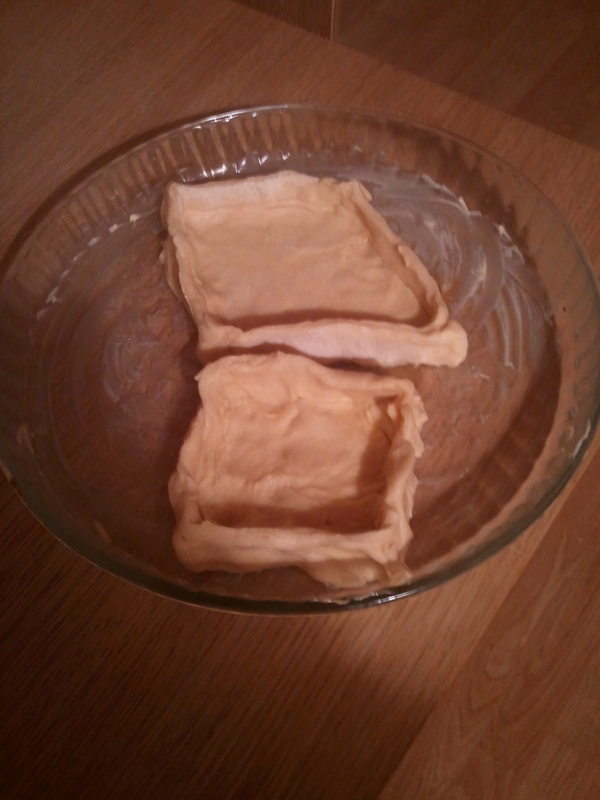 First, I put the yeast granules in some warm water with sugar, as instructed on the pack. If you are using dried yeast, you’ll need to reactivate it. Follow the instructions on the packet, although you will probably have to scale them down somewhat. My packet gave instructions for activating the yeast in 1/4 pint water, I didn’t want that much so had to use guesswork. 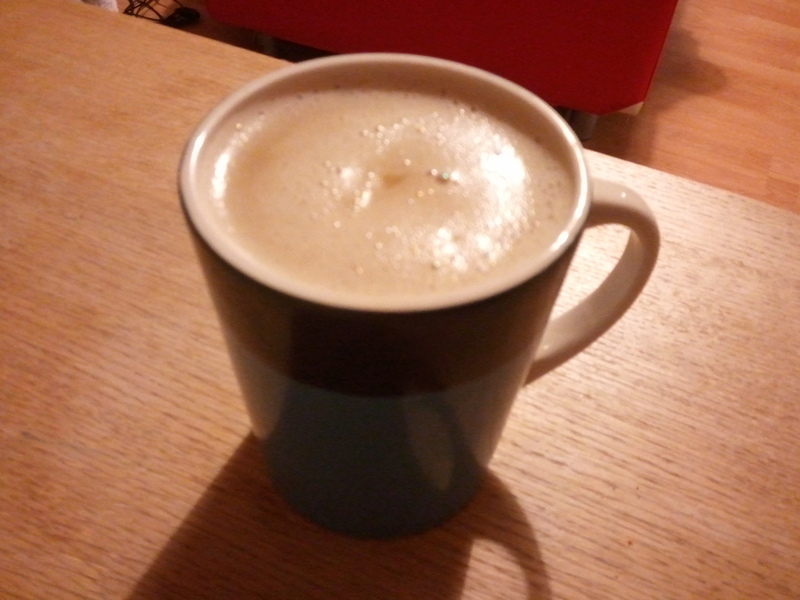 I used about 1/4 teaspoon of yeast with the same amount of sugar dissolved in about 1/3 espresso cup full of warm water. 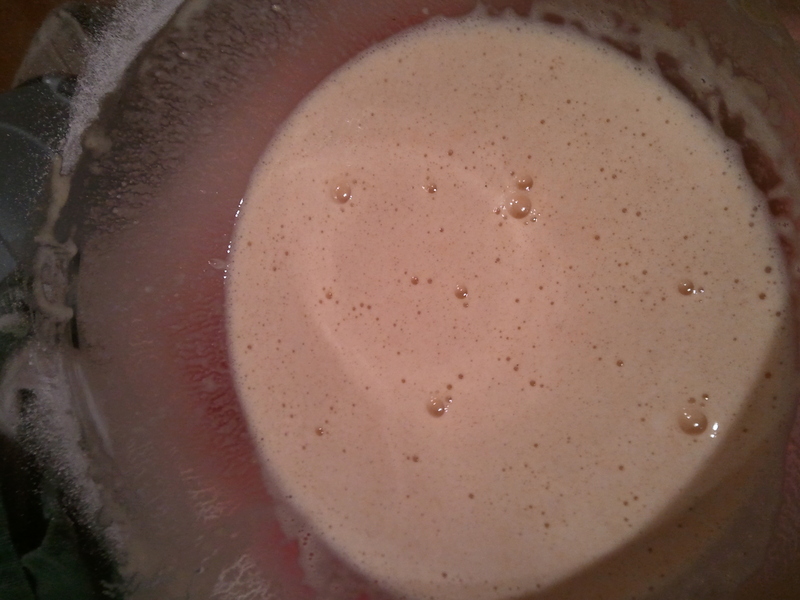 Once this started to froth I mixed it with 5 heaped tbsp plain flour, 4 egg yolks, 2 egg whites, 1 tbsp sherry (this is the “sack” – see the posset post for more information on this), 2 tbsp ale (I used Old Peculiar), a tiny pinch of salt and 1/2 tsp mixed spice. 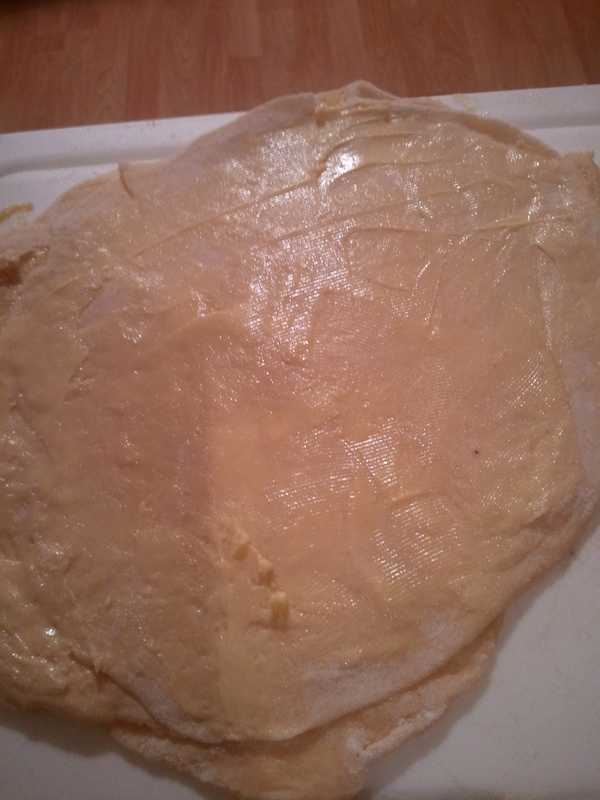 I then left it for about half an hour to “rise”, although it didn’t do much in the way of rising really. Lots of bubbles appeared on top though. 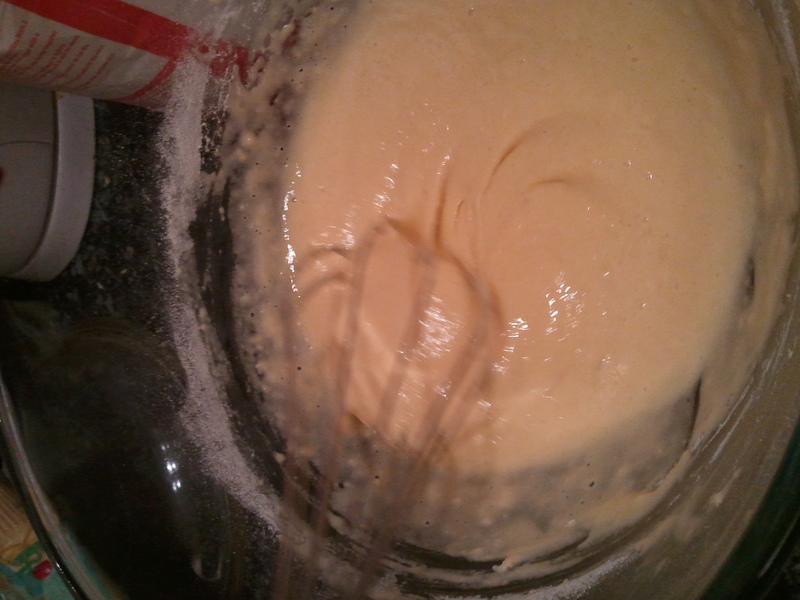 Then I melted some butter in a pan and added a ladle full of the batter. I cooked it for a minute or two on one side until mostly set on top. Then I turned it over and fried on the other side. It puffed and curled up quite a lot, when I took it out of the pan it stayed curled up at the edges, but the puffed up pancake sank as soon as it was on the plate. 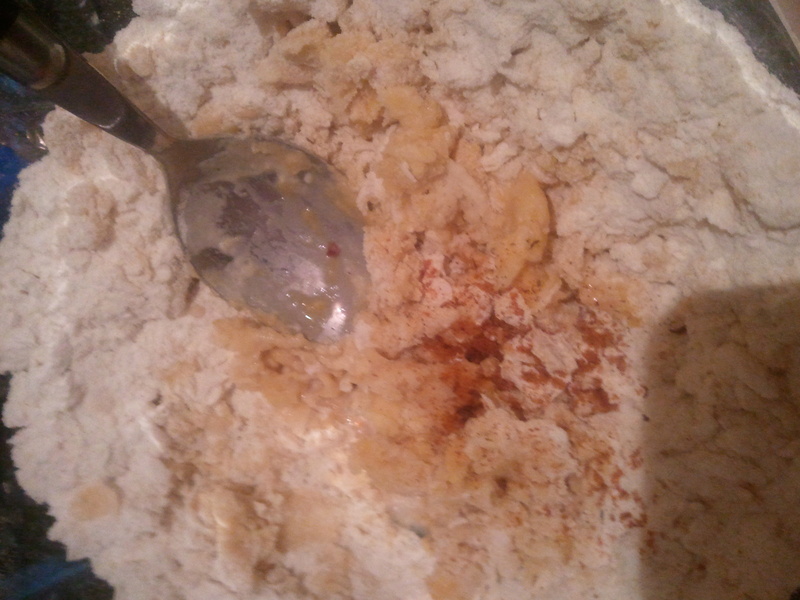 I sprinkled over orange juice, sugar and some orange zest as well. 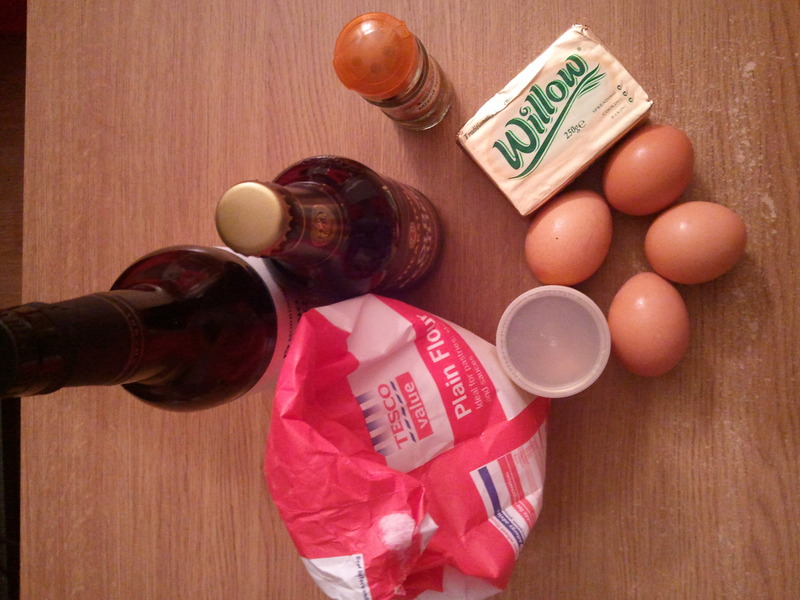 Whisk the egg whites and yolks together, then add the flour, sherry, ale, spice, salt and yeast. Leave to stand for half an hour or so. 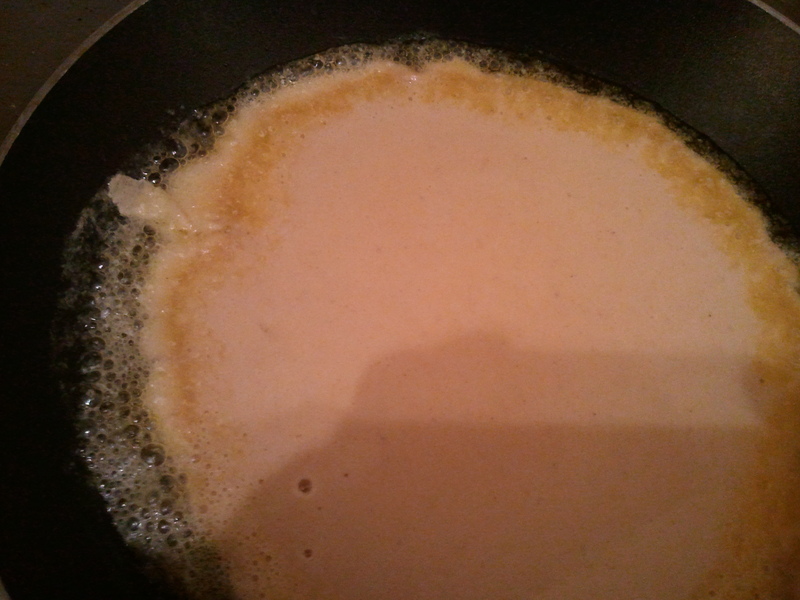 Heat a tablespoon of butter in a small frying pan and add a ladle full of batter when it is hot. 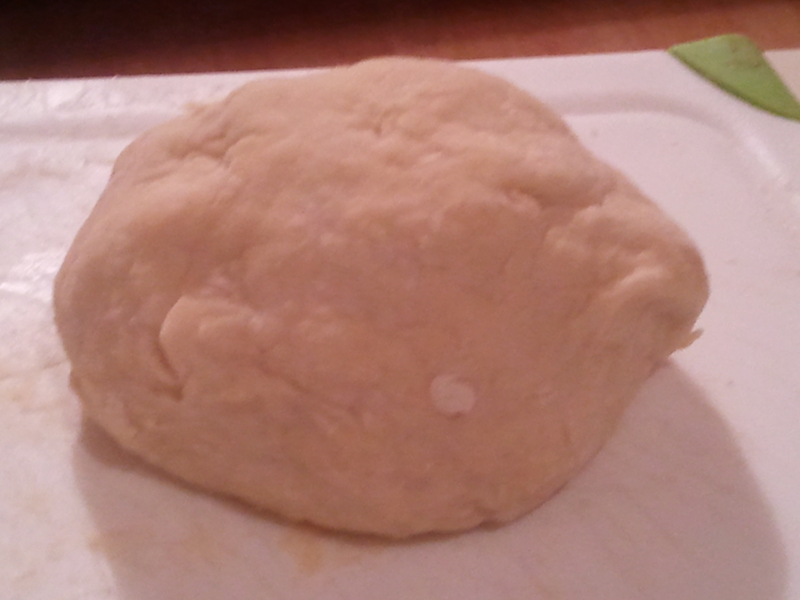 Cook until the top has mostly solidified, checking the underneath to make sure it isn’t burning. Turn over when bubbles start to appear and pop on the surface of the pancake. It will start to curl up a lot once you have turned it over and will only need about 30 seconds more until it is cooked through. 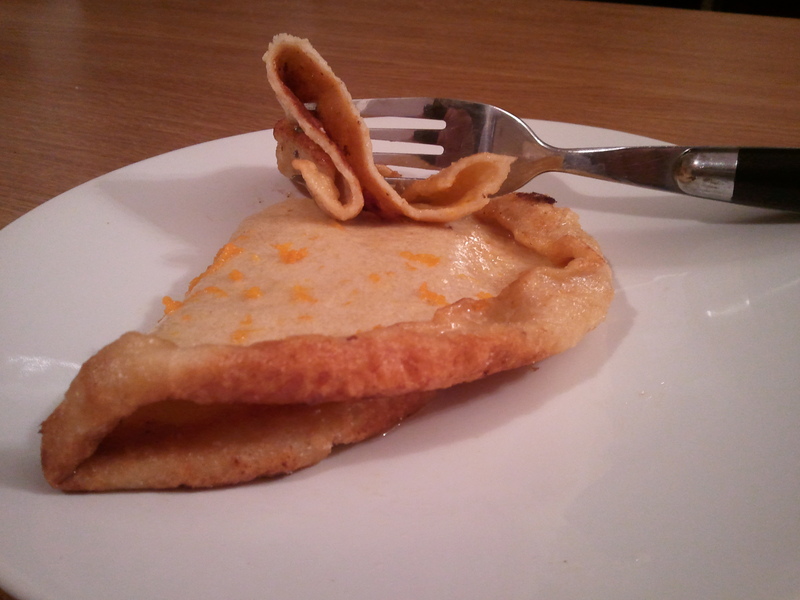 Slide onto a plate and add sugar and orange juice, and a little grated zest for colour if you like.